(Francisco Kjolseth | The Salt Lake Tribune) Lieutenant Gov. Spencer Cox becomes emotional as he relays his own experience of being bullied as a kid and having dark thoughts at the time during a press event to announce the creation of a community teen suicide prevention task force to combat the state's rising youth suicide problems. Lt. Cox and Rep. Steve Eliason, at left, will co-chair the task force as they search for fresh answers alongside numerous others. (Francisco Kjolseth | The Salt Lake Tribune) Lt. Gov. Spencer Cox, left, who directly acknowledged the heightened suicide risk faced by LGBTQ kids, speaks with Troy Williams, executive director of Equality Utah following an announcement of the creation of a community teen suicide prevention task force to combat the state's rising youth suicide problems. 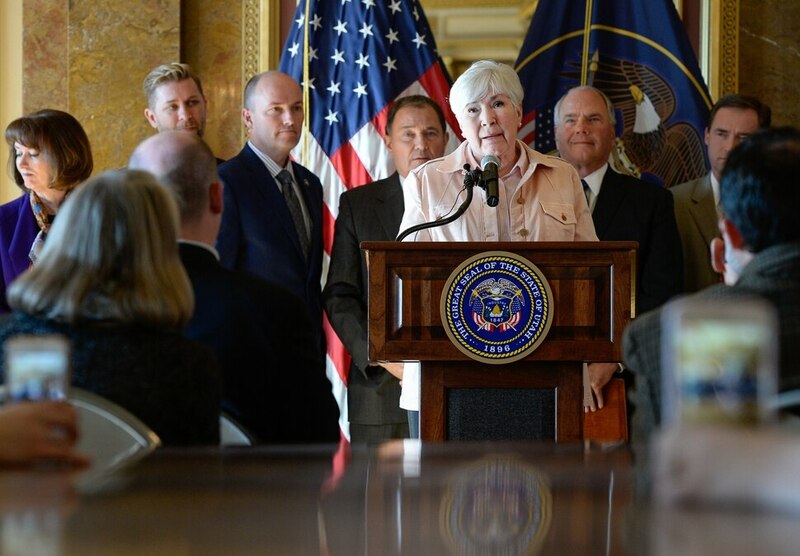 (Francisco Kjolseth | The Salt Lake Tribune) Gail Miller, chair of the Larry H. Miller Group, who like many has been touched by suicide, joins Gov. Gary Herbert and others to announce the creation of a community teen suicide prevention task force to combat the state's rising youth suicide problems during a press event at the Utah Capitol on Wed. Jan. 17, 2018. (Francisco Kjolseth | The Salt Lake Tribune) Gov. Gary Herbert and others announce the creation of a community teen suicide prevention task force to combat the state's rising youth suicide problems during a press event at the Utah Capitol on Wed. Jan. 17, 2018. (Francisco Kjolseth | The Salt Lake Tribune) Gov. Gary Herbert and others announce the creation of a community teen suicide prevention task force to combat the state's rising youth suicide problems during a press event at the Utah Capitol on Wed. Jan. 17, 2018. Also pictured are Rep. Steve Eliason, left, and Lt. Gov. Spencer Cox, at right, who will co-chair the task force and Troy Williams, executive director for Equality Utah, in background. (Francisco Kjolseth | The Salt Lake Tribune) Rep. Steve Eliason who along with Lieutenant Gov. Spencer Cox, at right, will co-chair a teen suicide prevention task force, announce their efforts alongside numerous others during a press event at the Utah Capitol on Wed. Jan. 17, 2018. Utah Gov. Gary Herbert on Wednesday announced he has formed a community task force that will attempt to tackle the state’s soaring youth suicide numbers, just as health officials shed more light on the trend. Herbert named a 14-member group to meet in the coming weeks and return by Feb. 15 with recommendations on how to slow the state’s suicide rate in young people. That four-week timeline, he said, would allow the panel’s ideas to be taken up by Utah lawmakers before they conclude their 2018 General Session on March 9. Some 44 youth ages 10 to 17 died by suicide last year, officials also announced at the Utah State Capitol event. That’s up from 33 suicides in that age group in 2016, but on par with the 2015 number, Utah Department of Health data shows. “That’s a tragedy that we need to see what we can do to change,” the Republican governor said, noting that other states in the Intermountain West are facing similarly high youth suicide numbers. The task force — organized in just the last few days — will be led by Lt. Gov. 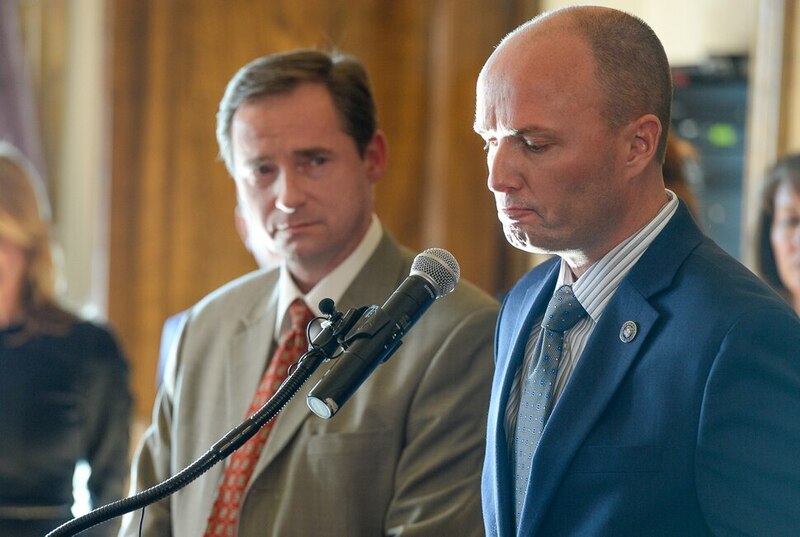 Spencer Cox and Utah Rep. Steve Eliason, a Sandy Republican who has long made Utah’s suicide problem a legislative priority. Other panel members include a mix of elected officials, suicide-prevention experts and community leaders; Herbert said the number of members could grow. He left open the possibility that the group would continue to meet after its Feb. 15 deadline. 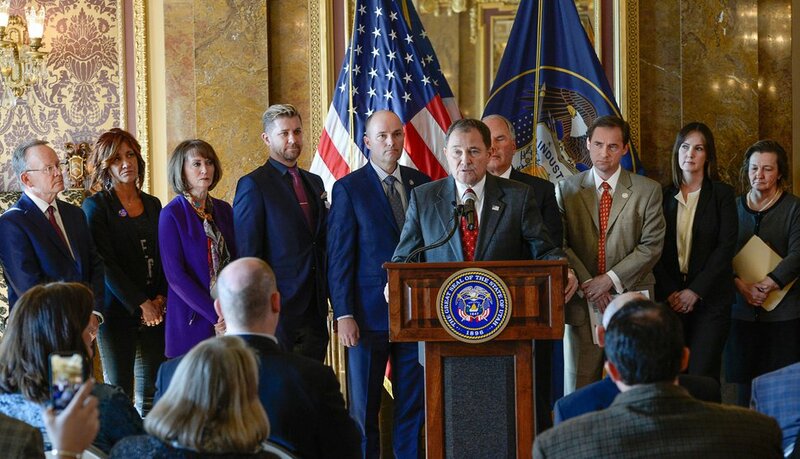 Herbert ordered the task force to first meet with members of an existing Utah Suicide Prevention Coalition to help develop priorities, then report on effective programs, tools and methods in youth suicide prevention in Utah. The governor did not specify any particular components he wanted to see in the plan. (Francisco Kjolseth | The Salt Lake Tribune) Gov. Gary Herbert and others announce the creation of a community teen suicide prevention task force to combat the state's rising youth suicide problems during a press event at the Utah Capitol on Wed. Jan. 17, 2018. The youth suicide rate in Utah has trended upward in recent years, growing at an average annual rate of almost four times faster than the rest of the nation. Youth suicide, Herbert pointed out, is now the leading cause of death among these young people. The governor did not directly answer a question about why such a task force is being created now, except to say he realized it was “time for more proactive action” after watching the numbers accelerate. His announcement Wednesday also comes on the heels of a November report by the federal Centers for Disease Control and Prevention that confirmed the extent of Utah’s youth suicide problem — and said that state officials could be taking more steps to address it. Just over half the youth suicides last year were attributed to firearms, with most of the rest suffocation cases, said Michael Staley, suicide research coordinator with the Utah Office of the Medical Examiner. Most of the suicide cases were older teens, he said, and about 34 percent were female, roughly 10 percent higher than the adult proportion of women who die by suicide. (Francisco Kjolseth | The Salt Lake Tribune) Rep. Steve Eliason who along with Lieutenant Gov. Spencer Cox, at right, will co-chair a teen suicide prevention task force, announce their efforts alongside numerous others during a press event at the Utah Capitol on Wed. Jan. 17, 2018. Eliason said he realized the 44 youth suicides last year “represents about 3,000 years that these children could have lived collectively, had they not lost sight of hope for just one potential moment.” The lawmaker urged parents and others to lock up firearms. The total number of suicides in Utah last year was 652, Staley said — the highest on record. He said the numbers remained preliminary, with several cases still under investigation. A prime focus for the task force is expected to be reducing access to guns, including possibly funding more trigger locks and gun safes that can be provided to families, Eliason said. Increasing access to suicide prevention programs in schools would be another thrust, he said. The one faith leader on the panel is Ronald A. Rasband, a member of The Church of Jesus Christ of Latter-day Saints’ Quorum of the Twelve Apostles. Cox said his parents divorced when he was ten. He was bullied. He began to have dark thoughts, thinking the world would be better without him. He didn’t realize at the time, he said, that so many others around him were suffering, too. Today, Cox pointed out, roughly one in five high school students report they have had suicidal thoughts. (Francisco Kjolseth | The Salt Lake Tribune) Lieutenant Gov. Spencer Cox becomes emotional as he relays his own experience of being bullied as a kid and having dark thoughts at the time during a press event to announce the creation of a community teen suicide prevention task force to combat the state's rising youth suicide problems. Lt. Cox and Rep. Steve Eliason, at left, will co-chair the task force as they search for fresh answers alongside numerous others. 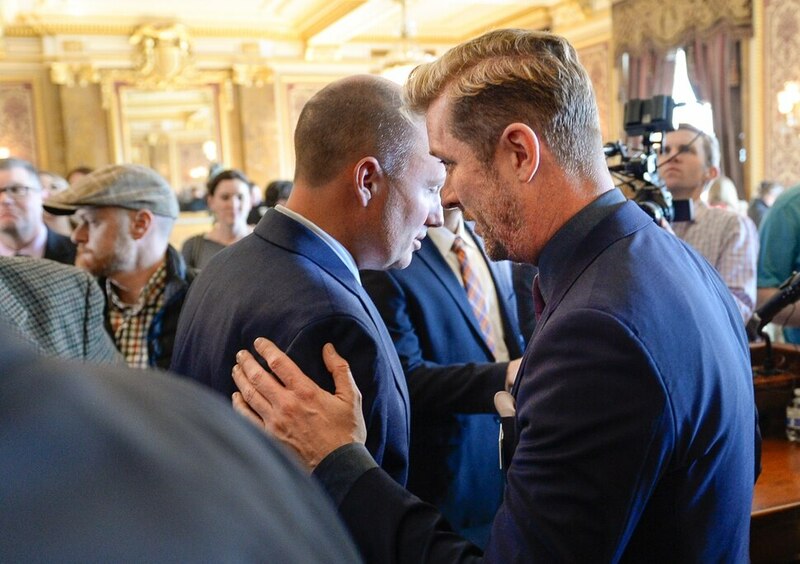 The lieutenant governor urged Utahns to reach out to those who might be struggling. Anyone experiencing suicidal thoughts is asked to call the 24-Hour National Suicide Prevention Hotline, 1-800-273-TALK (8255). Utah also has crisis lines statewide. Anyone who wants a gun lock to secure their firearms can email gunlocksUT@gmail.com. Tell The Tribune: How can the state prevent youth suicide?